Yes, I am aware that I already blogged about Mardi Gras in 2011. 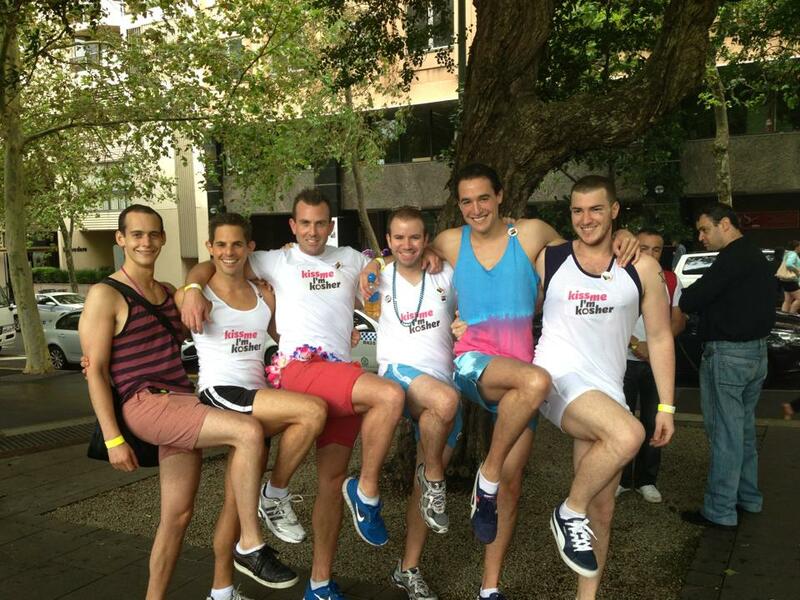 But this year’s Mardi Gras was pretty frickin’ amazing so I thought I ought to do a follow up blog. Also, I would have done a follow up blog for Mardi Gras 2012 except that it wasn’t as great because it rained on our parade. Literally. For the Jews reading this – and that’s probably a good chunk of you - “Mardi Gras” is actually a Christian tradition which marks the last day before Lent – the last day you can indulge for the forty days before Easter (or whatever it is). Now, the Louisianans have taken that indulgence to the extreme, but I reckon Sydney could give them a good run for the money. Originally, Sydney’s gay pride parade was held in June to commemorate the Stonewall Riots in New York – widely regarded as the start of the gay rights movement – but was moved to February to coincide with Australian summer back in the 80’s. With that move in date came the change in name which was fitting because it was conveniently scheduled right around the actual Mardi Gras. The parade is generally now on the first Saturday in March and marks the culmination of a roughly three week-long festival. 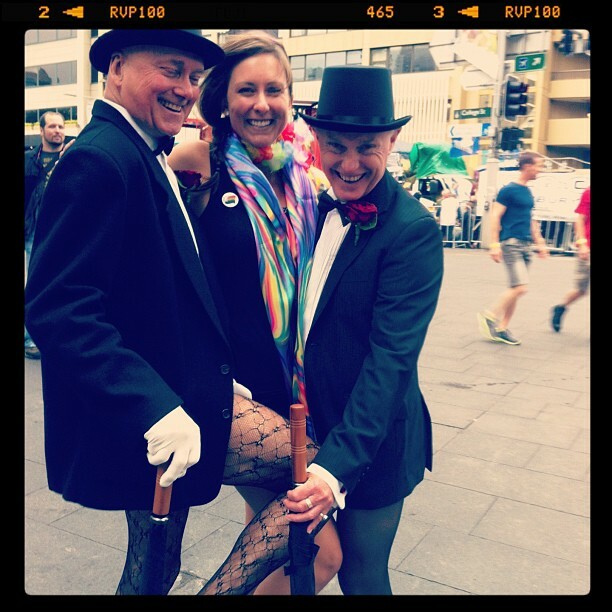 I hadn’t really delved into the full festival before, but this year I jumped right it to get more than just my toes wet. 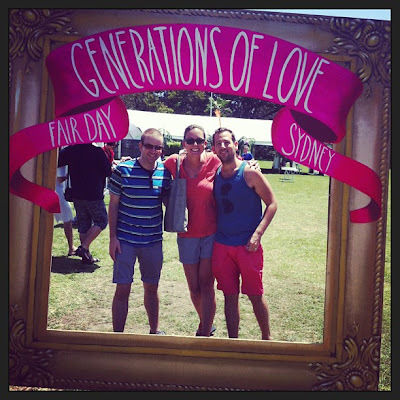 Fair Day kicks off the Mardi Gras season – a full day at the park featuring hundreds of stalls ranging from gay sports teams and community groups to charities and local businesses. There’s also food, rides, performances, and more. One of my besties, Jessica, tagged along this year with me and my posse of gay Jews. 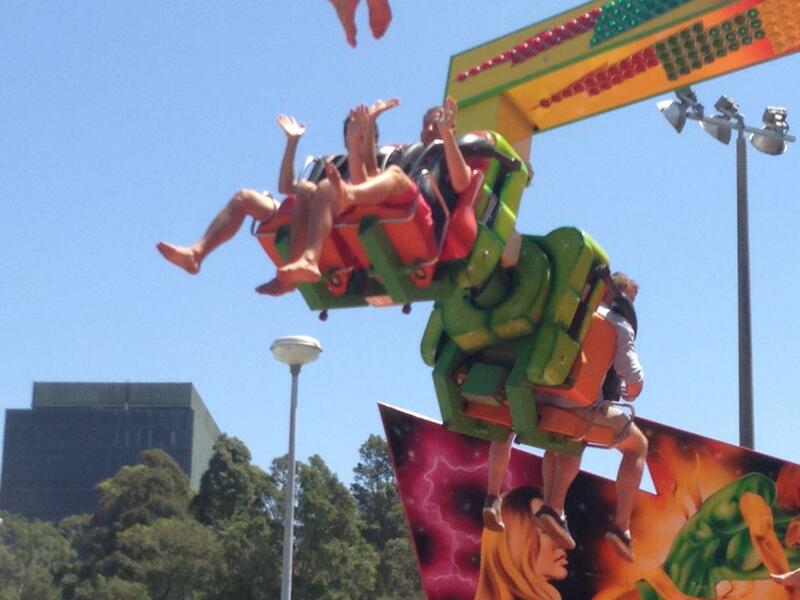 Elcid and David took their turn on this big loopy ride which flung them into the air upside down and every other way and it made me sick just watching them. On the flip side, there was the four hour long Torch Song Trilogy – a heart-wrenching three part play about a Jewish New York drag queen’s (mostly tragic) quest for love. 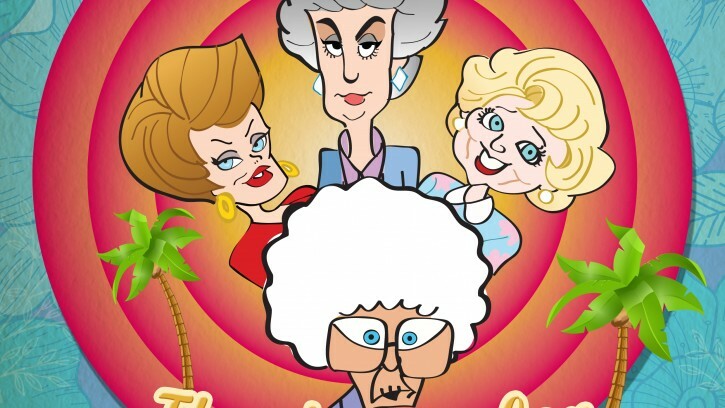 There was a Golden Girls puppet show. I’m not even shitting you. 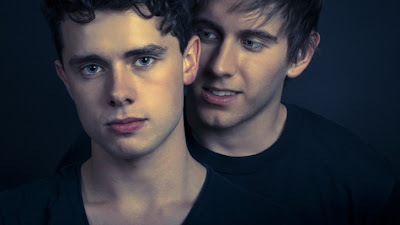 And the play version of one of my all-time favourite gay movies: Beautiful Thing – the story of two young neighbours who fall in love in a housing project in London. 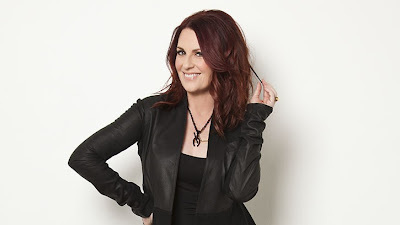 But the kicker was An Evening with Megan Mullally! Famous for her role as Karen on Will & Grace, Megan told the audience a bit about herself, sang a few songs (who knew she could sing so well?!?! ), and just made us laugh the entire time. I wish people would pay me that sort of money just to go on stage and talk about me! There’s also a whole Mardi Gras film festival, but my schedule was already filled up so I didn’t check any of them out, but it’s already on my agenda for next year. And parties. Don’t forget the parties! All day and all night parties, but they are quite expensive and I’d rather just go to bed (I’ve hit thirty and I’m feeling sleepy), so I didn’t go, but they are an integral part of Mardi Gras. Then there was the parade. I was a bit nervous as Mother Nature got all pissy and decided to rain heavily on last year’s parade, and this year’s weather was looking equally as sketchy. Also, my cape broke last year (yes, I had a cape on my costume) and I had to hold it on with one hand while marching, so that was a letdown. But, the weather held out for the most part and we were able to stay comfortably dry during the march and I didn’t have any sort of elaborate cape this year. Yay! 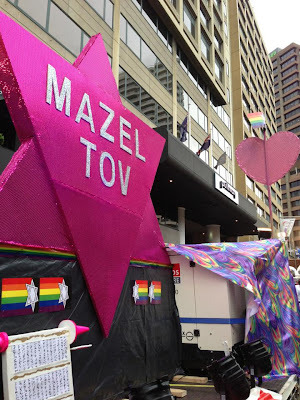 As this was Dayenu’s 13th year marching in Mardi Gras, it was only fitting that our theme was Bar Mitzvah. 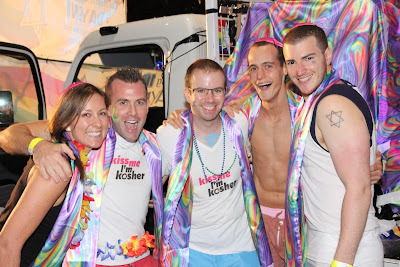 We had pink kippot and rainbow tallit! This pic of Brandon and Michael modelling our gear was so good that it was featured in a story about our float in Haaretz, Israel’s most influential newspaper. 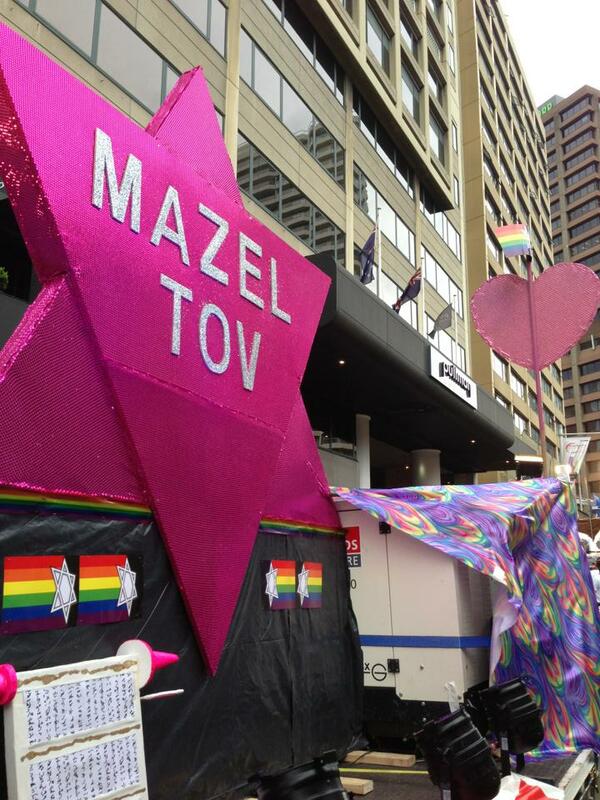 In addition to our fabulous kippot and tallit, our float had a giant Star of David inscribed with “Mazel Tov”! Because it wouldn’t be a Bar Mitzvah without a good dose of mazel tov! A few of us made “Kiss Me, I’m Kosher” t-shirts to wear, and we had some fun posing for a picture or two. The best part of the parade is the staging area beforehand. For 2+ hours, all of the floats are lined up behind fences and you can walk around and check out all of the fabulousness. 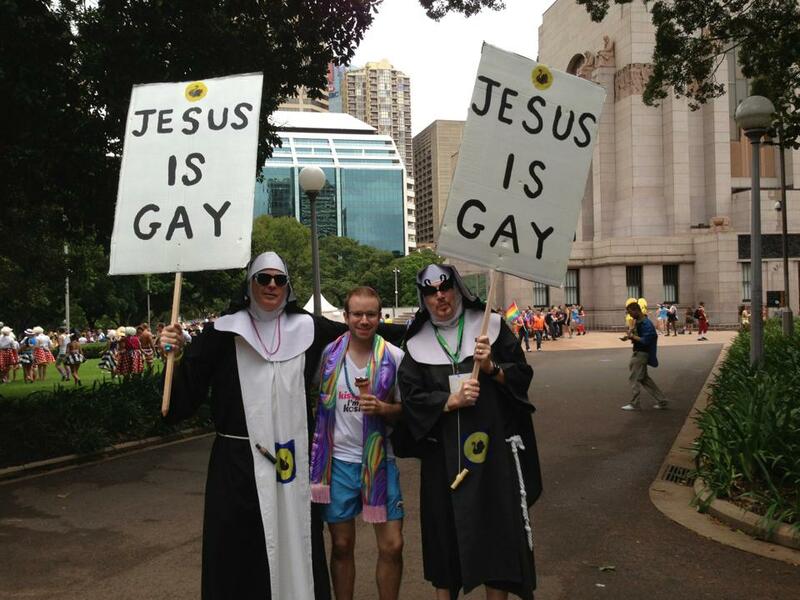 And by fabulous, I mean drag queen nuns out to spread the truth about Jesus. 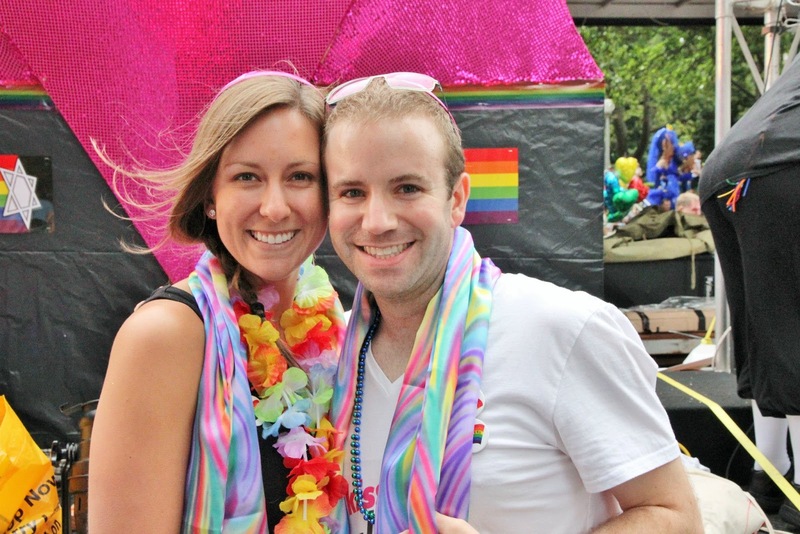 Did I mention that Jessica accepted an invitation to march with the gay Jews this year, even though she’s straight and Episcopalian? We don’t judge. 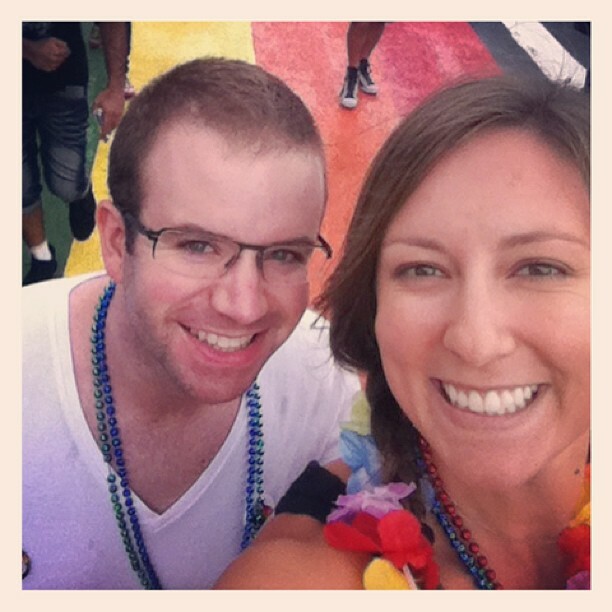 She even snapped a photo of us walking over to the parade as we crossed the rainbow crosswalk at Taylor Square! And then it was over and we celebrated with Thai food and gelato because all of the gays (aside from me) had been starving themselves to get skinny for Mardi Gras and they were ravenously hungry. Silly boys. As the night faded, we began the important process of starting to make plans for next year’s parade. How exciting!